The Op Shop is open……. 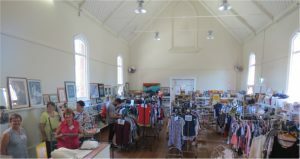 In October 2015 The Christ Church Op Shop celebrates 50 years in existence. Well done! COMMITTEE MEMBERS: Chris Angus, Margaret Broughton, Celina Miles, Margaret Pereira, Janette Roulston, Maureen Lanyon, Jenny Wilson and Joan Sach. The Op Shop welcomes donations of clothing, books and magazines (Women’s Weekly, New Idea, Women’s Day & Westerns), bric-a-brac, china wear, crystal, CDs / DVDs, pictures, kitchen wear and plastic items. We cannot accept matresses, pillows, electrical goods and furniture, prams and pushers, bike helmets unless brand new. As well as DONATING MONEY to maintain our church, DONATIONS FROM THE OP SHOP presently or in the past have gone to organisations and community group such as Anglicare, Anglican Board of Mission (ABM), Anglicord, Bush Church Aid Society, Benetas, Church Missionary Society, National Home Mission Fund, Society for Promoting Christian Knowledge, Trinity College, Ridley College, Strathmore Secondary College Chaplaincy Committee, Buckley Park Secondary School Chaplaincy Committee, Bible Society, Ascot Vale Special School, ACCESS Ministries, Caroline Chisholm, Save the Children (Breakfast program), Royal Flying Doctors Service, Essendon Primary School (camps/excursions), Essendon North Primary School (camps/excursions), State School Relief, Melbourne City Mission (homework program), North West Region Girl Guides, Yooralla Special School (equipment), PLUS MANY OTHER CHARITIES …..
2. Establishment funds to be obtained by the issue of Five Pound debentures. The holders of these debentures were Mesdames A. Carter, P. Ferguson, I. Hinde, M. O’Neil, S. Roylance, L. Smith, C. Spink and R. Warren. At the first Committee meeting on 4th August 1965, approval was granted by the Vestry to open an opportunity shop and the official name was to be Christ Church, Church of England, Essendon Opportunity Shop. Tenancy commenced on Monday 16th August 1965 at 14 Leake Street, Essendon and a rental of ten pounds a week was paid. The shop opened for business on the following Thursday. The debentures were paid back on 2nd September 1965. By the 15th November 1965, the bank balance of the Opportunity Shop was five hundred pounds, indicating that the shop had had a successful beginning. Larger premises were being sought. The business moved to 6 Leake Street with a three-year lease on 1st February 1966. The Constitution was accepted on 29th August 1967. The business developed and expanded and in March 1974 the Shop moved to 3-5 Leake Street. On 25th May 1985 the decision to no longer open on Mondays was made. A Thanksgiving Service was held on Tuesday 17th September 1985 to celebrate twenty years of the Opportunity Shop’s operation. The weekday closing time changed to 4.00 pm on 15th September 1986. The Opportunity Shop celebrated its twenty-fifth year of service to the Church and community with a Thanksgiving Service on 19th September 1990. In 1991 the Committee first held discussions about moving the shop’s operations from Leake Street to the Christ Church Hall. At the AGM on the 7th September 1992, it was decided due to the constantly rising rent, that the shop could only continue in Leake Street for twelve more months. On 16th November 1992 the Opportunity Shop donated $50,000 to the Parish Centre Project, to be used at the Vestry’s discretion. Plans then began for a move to the Parish Centre. The Leake Street premises closed on 28th August 1993 and on 3rd September; there was luncheon and display of the new premises. The Grand Opening of the Opportunity Shop in the Parish Centre was held at 9.30 am on 4th September 1993. The old Kindergarten sign was converted to one advertising the Opportunity Shop. On 22nd November 1994 the Opportunity Shop opened all day to coincide with the Church Fair, a tradition that has continued. In July 1995 the roof of the Parish Centre (original church) and the Opportunity Shop was completely replaced at a cost of $17,000. The Opportunity Shop has continued to flourish and has been able to support many charities as well as contributing to building works and maintenance at Christ Church. In 2002, underpinning and re-plastering of the Opportunity Shop had to be undertaken. After receiving insurance money it cost the OpShop about $43,000; the floors were also re-done. The workers performed a minor miracle in emptying the shop for this work and then having it ready to re-open in the New Year. In 2010, the Opportunity Shop raised money to update the vicarage as well as making many donations to the community. During the Victorian Bush Fires the Opportunuty Shop made significant donations. The Christ Church Opportunity Shop continues to be a vibrant and exciting place. From 1965 to the present over two hundred ladies have given time, talent and energy to maintain the shop at a level of efficiency which is respected throughout the local community. Many hours of labour have been provided by some of the men of the parish in the repair and maintenance of both goods and shop fixtures. Thousands of dollars have been donated annually to local and national charities as well as to Christ Church Anglican Church.